Home/Science/Are Neonicotinoid Pesticides Killing Bees? Are Neonicotinoid Pesticides Killing Bees? This was a big week for bee news! New research on bees and pesticides was published, and a major white paper from the Xerces Society on the same topic was released. The pesticides in question are called Neonicotinoids, since they are derived from nicotine (used as a pesticide since the 1700's). "Neonics" are systemic insecticides, or insecticides that are taken up by a plant's tissues and circulate within the plant. This makes these pesticides a highly effective and relatively safe insect control method, since only insects that eat the plant will be affected. It also is sometimes the only way to kill insects inside a plant; an insect boring into a tree, for example, can't be sprayed directly. Neonicotinoid pesticides can also be applied as a root drench or a seed treatment, so there is no pesticide sprayed into the air, or landing where it should not go. Farmers love neonicotinoids, since they not only reduce "off-target" effects, they last a really long time–usually one application can last for months, and sometimes over a year. That saves a lot of money. The problem is…because the insecticide circulates in plants' tissue, it shows up in flower nectar and pollen. And that's what bees collect and concentrate, and take back and feed to their young. What initially seemed to be a very environmentally-friendly group of insecticides is turning out to be a risk for bees. Carl Zimmer's excellent New York Times summary of the research on bees and pesticides is a must read: Bees' decline linked to pesticides. "In Thursday’s issue of the journal Science, two teams of researchers published studies suggesting that low levels of a common pesticide can have significant effects on bee colonies. One experiment, conducted by French researchers, indicates that the chemicals fog honeybee brains, making it harder for them to find their way home. The other study, by scientists in Britain, suggests that they keep bumblebees from supplying their hives with enough food to produce new queens….The authors of both studies contend that their results raise serious questions about the use of the pesticides, known as neonicotinoids." I found this story to be especially challenging to sum up in a single nut graph. To begin with, these experiments came after many years of previous experiments and surveys, which often provide conflicting pictures of what’s going on with insecticides and bees. The experiments themselves were not–could not–be perfect replicas of reality, and so I needed to talk to other scientists about how narrow that margin was. As they should, the scientists probed deep, pointing out flaws and ambiguity–in many cases even as they praised the research. At the same time, these two papers did not appear in a vacuum. Other scientists have recently published studies (or have papers in review at other journals) that offer clues of their own to other factors that may be at work. And, biology being the godawful mess that it is, it seems that these factors work together, rather than in isolation. If Carl Zimmer–an exceptional science journalist with access to the actual scientists that are doing the research–is having trouble trying to create a coherent picture of the information about these pesticides, I KNOW that the rest of us regular schmoes are struggling too. Here is the important thing to remember as you process this new bee research: CCD, or colony collapse disorder in honeybees, does not have a single cause. It's likely that many different factors work together to create CCD. It is a complex set of specific symptoms, and it's been known since around 1900 by many other names. 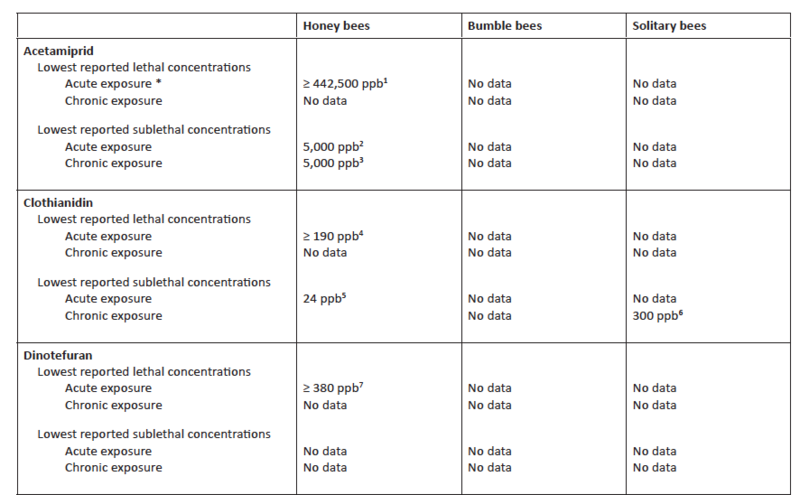 Additionally, not all observed bee declines (and deaths) are CCD. It's hard out there for a bee. "There is no direct link demonstrated between neonicotinoids and the honeybee bee syndrome known as Colony Collapse Disorder. However, recent research suggests that nenonicotinoids may make honey bees more susceptible to parasites and pathogens….which has been implicated as one causitive factor for CCD." The Xerces paper is probably the best review of the recent research that you are going to find. Not only is it written by Xerces scientists, who are folks what really know their bees, it also was reviewed by several other bee researchers I have a great deal of respect for. Xerces thoroughly documents what we know about these pesticides and bees–and, unfortunately, we don't know nearly enough. Most of the published research focuses on honey bees, rather than the native bee species in the US. (Honey bees are an introduced species in North America). That means we don't have much data to work with to figure out how different bee species will be affected. "Products approved for homeowners to use in gardens, lawns, and on ornamental trees have manufacturer-recommended application rates up to 120 times higher than rates approved for agricultural crops. Many neonicotinoid pesticides that are sold to homeowners for use on lawns and gardens do not have any mention of the risks of these products to bees, and the label guidance for products used in agriculture is not always clear or consistent. Neonicotinoids can persist in soil for months or years after a single application. Measurable amounts of residues were found in woody plants up to six years after application." Xerces raises some very important questions about what this means for our native bees that are already struggling with habitat loss and a spill-over of parasites and pathogens from introduced bee species. Butterflies, beetles, and flies also drink nectar and feed on pollen–pretty much any of our pollinators, including hummingbirds, could be affected if they feed on trees and plants treated with these insecticides. I hope that new labeling is introduced so consumers know that these products have the potential to kill bees and other pollinators. Unfortunately, because these pesticides are so very useful in agriculture, there are no easy answers. The things that make these compounds so very well suited for so many purposes–their ability to remain stable for a long time and spread through plant tissues–are also why they pose dangers for pollinating insects. 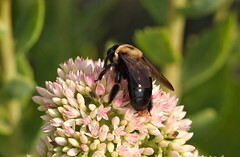 Xerces guide to promoting native bees; tons of free information to download! Take a short training course on creating bee-friendly habitat! Bug_girl has a PhD in Entomology, and is a pointy-headed former academic living in Ohio. She is obsessed with insects, but otherwise perfectly normal. Really! If you want a daily stream of cool info about bugs, follow her Facebook page or find her on Twitter. Wait, I thought it was cell phones. You mean it's not cell phones? I cannot thank you enough for all of this information! I've been following this on the periphery for a while, but I don't know that much about the actual science that's been going on. I am sharing this with my fellow bee-buddies, hopefully it will clear up confusion to at least some degree. Off Topic: Does anyone know anything about this study: http://www.thehealthyhomeeconomist.com/new-study-hepatitis-b-vaccine-damages-the-liver/ regarding Hepatitis B shots for infants? I want to make sure that there's no bull science being tossed about for it – and it's got some friends of mine in a tizzy over their new baby getting the vaccine. Of course, that is just guilt by association. The study refered to is an in vitro test of the response of mouse liver cells to Hep B vaccine. It's a new report and I couldn't find any non-sensationalized reviews of it in any of the usual places such as Science Based Medicine and Respectful Insolance. However it seems a long way to me from an effect in a test tube on mouse cells to a real clinical effect on humans. The abstract of the paper refers to aluminum hydroxide (an adjuvant in the vaccine) as the culprit, but I don't know how they know this. In any case, the known risks of Hep B are much higher than the unknown, but epidemiologically miniscule risks of the vaccine. Thanks! This helped a lot. Either way, what are the consequences of being wrong about neonicotinoids and bees? To me it’s a no-brainer. Actually, there are a lot of consequences. As I said in the post, neonics are actually fairly environmentally friendly (as pesticides go) because they are applied directly to the plant, not sprayed into the air. We keep asking farmers to produce cheap food for us, but then limiting how they can do that and still make a living. Ultimately, if the problem for bees is habitat loss, or diet, or disease, or (most likely) all of those, focusing on the wrong target to “fix” means that we haven’t solved the problem. Support a project to make TV science better!